Synopsis: The Burren on the western seaboard of Ireland was then, in the year of 1509, as it is now, a land of stony fields and swirling mountain terraces. The people of the kingdom lived peacefully by the ancient Brehon laws of their forebears. On the first eve of May hundreds of people from the Burren climbed the gouged-out limestone terraces of Mullaghmore Mountain to celebrate the great May Day festival, lighting a bonfire and singing and dancing through the night, then returning through the grey dawn to the safety of their homes. But one man did not come back down the steeply spiralled path. His body lay exposed to the ravens and wolves on the bare, lonely mountain for two nights . . . and no one spoke of him, or told what they had seen. And when Mara, a woman appointed by King Turlough Don O’Brien to be judge and lawgiver to the stony kingdom, came to investigate, she was met with a wall of silence. Review: The amazingly talented Cora Harrison, a veteran novelist for children, steps into the adult sphere w/ an alluring historical novel that will knock you breathless w/ her vivid imagery. Harrison has created an empowering heroine w/ the delightful, energetic & lovable Mara. Harrison delivers the goods w/ an unparalled mystery set in a medieval kingdom off the spectacular coast of Ireland. Mara is Brehon (a medieval Irish judge) of the Burren, appointed to this distinguished position by the King himself, following the death of her father many years prior. Aside from the duties of Brehon, Mara also runs an area law school. Whew! How do we spell busy? M-A-R-A! Harrison does a phenomenal job @ delving into the very core of human nature in this remarkably electrifying novel! Mara really was spot on w/ her sleuthing skills. I found myself holding my breath @ times while she was on the "hunt" for the culprit. Harrison presented the clues & facts but I was still left speechless. Brava, to the awesome Harrison for pulling me in, hooking me all along & making me feel my adventure was more than I dared to dream. What an adrenaline rush it was for me, as I furiously turned the pages. WOW!!! Harrison's prose is rich, beautiful & extremely well written. I loved My Lady Judge & will be reading the rest in this incredible series! Check out Cora's terrific website here! Sounds like a really good read. I'm looking for historical fiction novels this years. I'll go ahead and add this one to my list. Thanks for a great review. I love the mixture of history and a mystery so I'll be keeping an eye out for this one. Oh this sounds really good. I haven't read many books based in ancient Ireland either, so this one will fit the bill. Thanks Countess. The King appoints a woman to be Judge? In 1509? That's something I never thought I'd hear. The laws way back in Ireland were called Brehon laws and believe it or not women in Ireland in this time period had a lot of say... 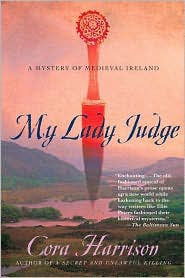 I read this story a few years ago and I have hunted to find the second and will also be getting the rest in this series.... does being Irish have anything to do with my obsession??? Great Review!! I am usually not into mystery type books but this is one is very intriguing with the historical aspect. Enjoyed your review Diane. I do love historicals set in Ireland so will keep an eye out for this one!